Academic discussion about agency has shifted towards agency as something the player perceives, rather than necessarily involving visible and lasting effects within a storygame. Existing work suggests players experience perceived agency even when no consequences result from their choices, due to various features and techniques used in storygames. 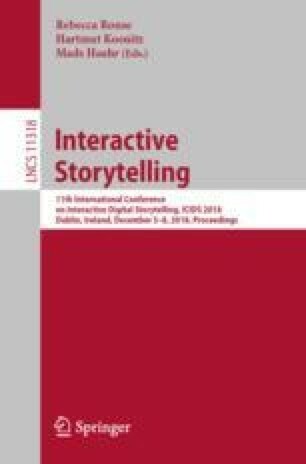 This paper aims to understand the experience players have when engaging with choices and playable characters when playing storygames that produce a sense of perceived agency. We conducted retrospective protocol analysis and interviews with 15 players who played one of three games, The Wolf Among Us, Oxenfree and Kentucky Route Zero. Our findings suggest that perceived agency arises both from the player’s ability and willingness to engage in meaningful expression of the playable character’s personality within constraints, resulting in the creation of a unique playable character, and from the system’s recognition of this expression of the playable character’s personality through appropriate feedback.